WINTER OPENING: Closed from October 31st until Dec 9th then open every day until 12pm on 24th December (Hours when open: 9.00am - 5.00pm). Shop will then be closed until 10th April 2019. All walks, nature trails, picnic areas, wildlife sanctuary are FREE. Inverawe Visitor Centre is a delightful place to get away from it all! Completely unspoilt, with an abundance of both flora and birds you can just walk a nature trail through woodlands and parkland. Enjoy walking down on the river's edge, or walk down to Loch Etive and enjoy all the seabirds. A beautiful walk through the forestry and then onto a track along the lochside as far as you wish. Feel free to take a picnic and make a day of it! Go straight out of the car park up the road you came in on. Turn left up the tarmac road for about a quarter of a mile, this leads onto a forestry track at the top of the hill. Follow the track straight on for about 3 miles which eventually opens up onto the hill. All dogs must be kept on leads through farmland as there are a lot of sheep! 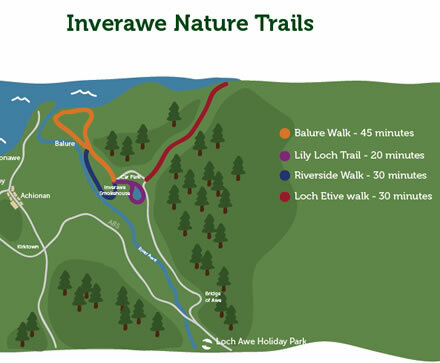 A charming short walk through the surrounding woods and lochs, with plenty of paths and tracks for children to enjoy. Head towards the Smokehouse and turn left up the hill along the clearly marked Natural Trail. Follow the path up the hill, along the ridge, down through the woods and up to the Lily Pond, which should take about 20 minutes. At the Lily Pond turn right for the short route back to the carpark or left around the Lily Pond. A lovely walk through the fields down by the river. From May to August enjoy the sandmartins on the opposite bank, they are a joy to watch, swooping low over the waters straight into their nests in the river bank. Go to the Smokehouse and turn right along the path leading down to the field. Go through the wrought iron gate (remembering to close it as the cows always think it's greener on the other side!). Walk along the fence towards the river and swing bridge. Turn right at the river; past the bridge, through, or over the gate and carry on along the river. About 100 yards before the power station, turn away from the river and follow track to the gate on the road. Turn right for the quick walk back, or continue on to Loch Etive. This walk is referred to by residents of Inverawe as 'down to the loch'. Just the right length for a daily walk, with wonderful views of Loch Etive, hundreds of rabbits for the kids to spot and always some bird life on the loch side. Turn left out of the car park along the road. Carry on up past the powerhouse on the left and down the hill towards the loch. Follow on along the road which after about 200 yards will turn to track. Follow the track either right or left down to the loch (it's a loop so you can go either way). Enjoy the peace and quiet of the river mouth and the multitude of wildlife. Lastly, please remember to shut gate at all times. Dogs are welcome but please keep them on leads as there are sheep around! The Inverawe tearoom, with its spectacular panoramic view over Glen Lonan and the river, just has to be the best place to try out some fabulous traditional Scottish food, from our own range of smoked goodies to a selection of fine traditional home baking. It is a superb place to test the old saying - "the proof of the pudding is in the eating". It is all delicious. Our Inverawe gourmet shop has a complete range of Inverawe smoked foods along with the very best of other gourmet Scottish foods. In addition to the fine foods there is an extensive array of cookery books, kitchen gadgets and home smokers that will give hours of pleasure. The children's section of wooden toys and puzzles will keep them busy for hours. Visit the smokery to see how Inverawe salmon is smoked. 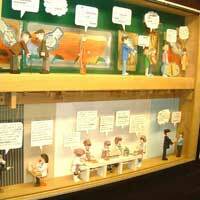 Enjoy the exhibition with its complete pictorial view of the smoking process and marvel over the moving models. The exhibition is for all ages, great fun and very informative.